It's been almost two years since I have logged into this virtual kitchen of mine!! YES!!! It's been that long and I am alive!! So let me start off by saying a big Hello to all the lovely readers of Paaka-Shaale. It's been almost two years since this blog has seen any posts. So much has happened in the last two years that I really don't know where to start. First, there was this unexpected move to Bangalore. Which turned our world upside down to say the least. Along with this move came a series of challenges. One of them being Purvi's school. It was such a major challenge for us, that she had to change the school twice in one year. There were also issues with our cargo. At one point of time, I felt like my stuff was scattered all over the globe. All of this sort of left me feeling like a nomad. Even after all these days, if someone asks me if I am settled, I am not sure what to answer them. With all this happening, blogging invariably took a back seat and this virtual kitchen of mine got neglected. So neglected, that I even thought of shutting down the blog. However, thanks to my family and some friends who kept bombarding me with talks of "wasted talent" and "opportunities". I pulled myself together and decided to breath a new life into this virtual kitchen of mine. 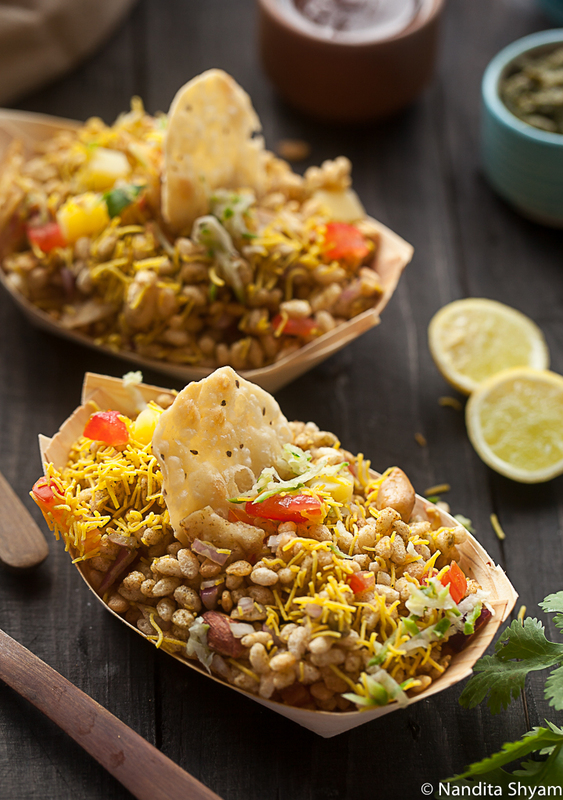 So thanking the almighty and my family for everything, I am here today to share a simple yet fantastic recipe for rice krispie bhel. 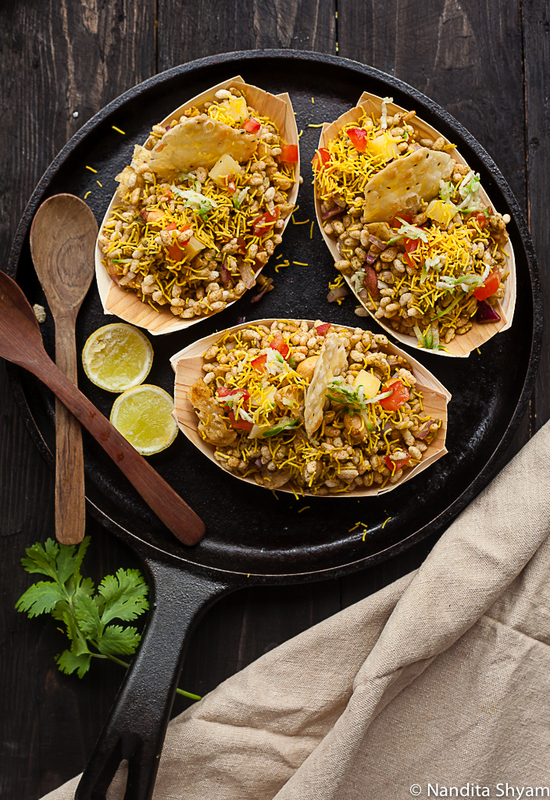 As you all know Bhel Puri is a chaat and savory snack that is traditionally made with puffed rice, vegetables, sev, chutneys and peanuts. In this case however, I have replaced the puffed rice with the rice krispie cereal. The rice krispie is a breakfast cereal that snaps, crackles and pops. Unlike the puffed rice, this cereal doesn't turn soggy very fast and I believe that they retain the crunch a few minutes longer. 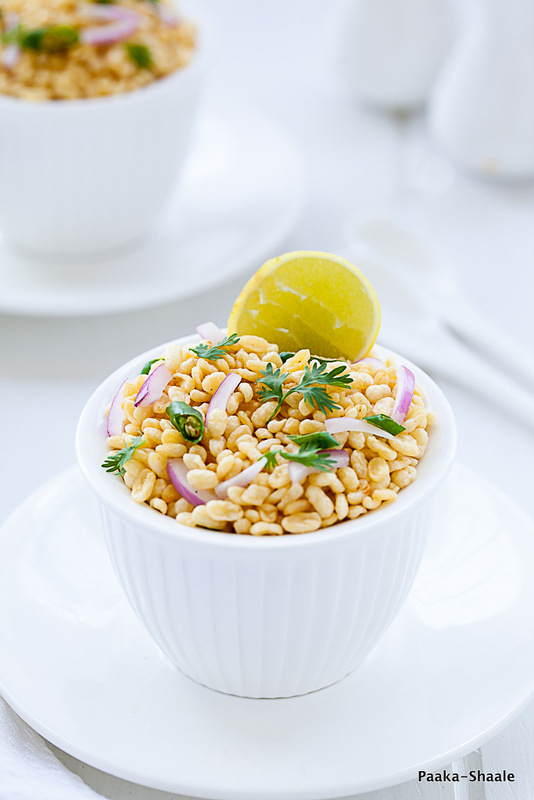 I would also like to warn you that this version of bhel is a tad bit more addictive than the one with puffed rice. I believe that there is 99.9% chance that you will start eating from the ladle itself. But Jokes apart, lets proceed to the recipe. Shall we?? Green mango- 1-1/2tbspn- finely grated. 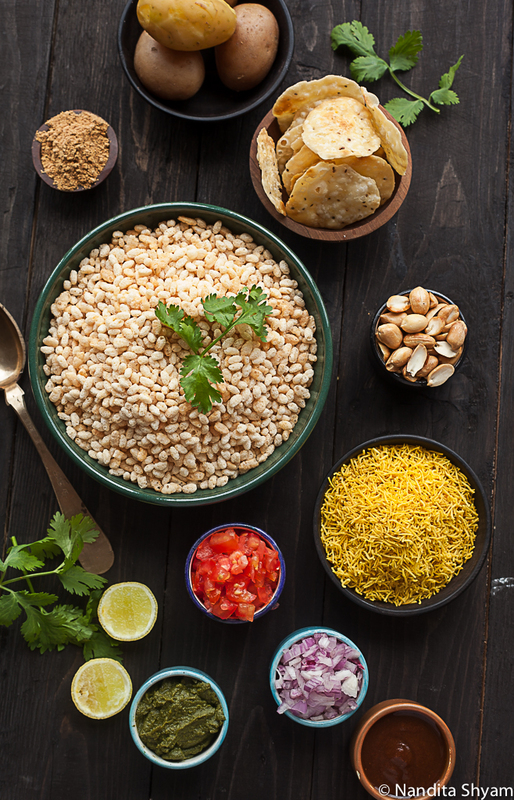 In a large bowl, combine the roasted, rice crispies along with the chopped onion, boiled onion, tomato, boiled potatoes, peanuts and grated mango and mix well. Add the date tamarind chutney, green chutney, Black salt, red chili powder, and chaat masala and mix. Top the mixture with Nylon sev and crushed papdi and toss. 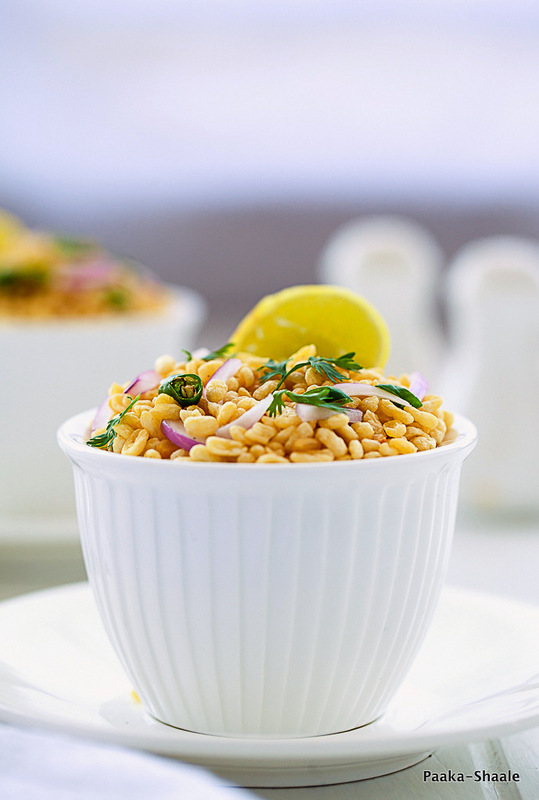 Garnish with coriander leaves and lemon juice and serve immediately. I am really not sure why this spice mix is called Menthya hittu. 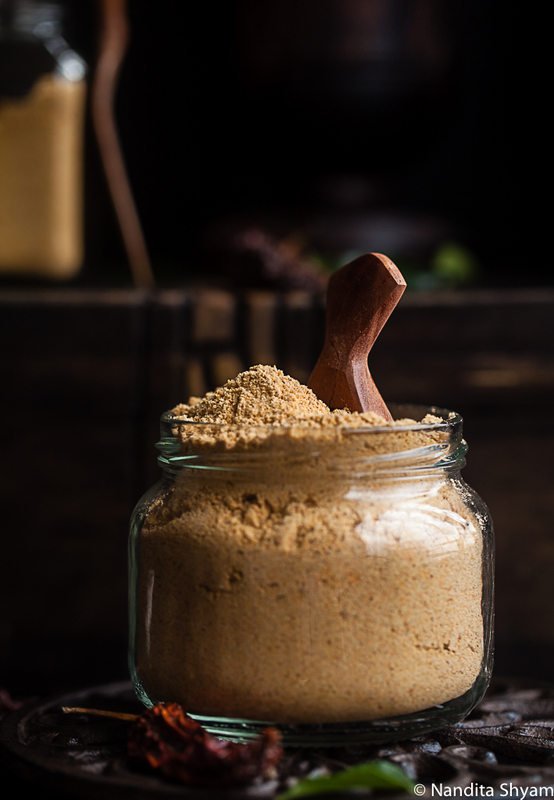 That's because only one to two tea spoons of Menthya aka fenugreek seeds go into this powder. 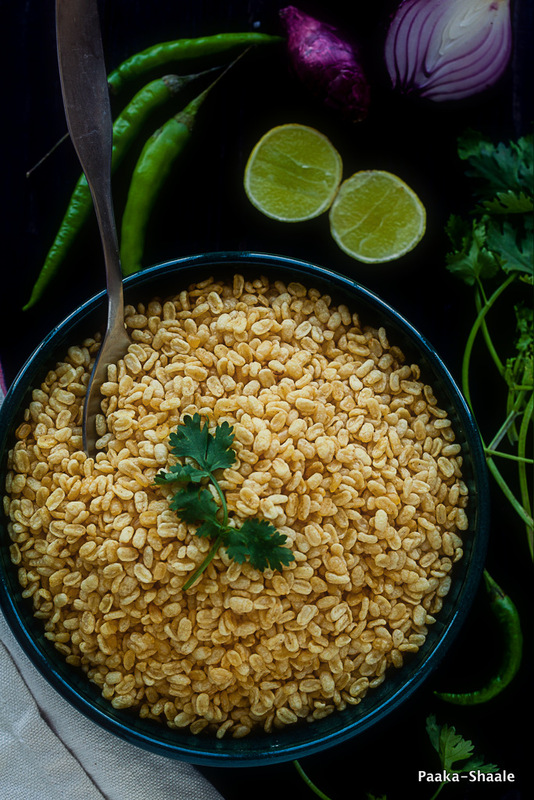 Given it's inherent bitter taste, Fenugreek seeds may not be a favorite with everybody. 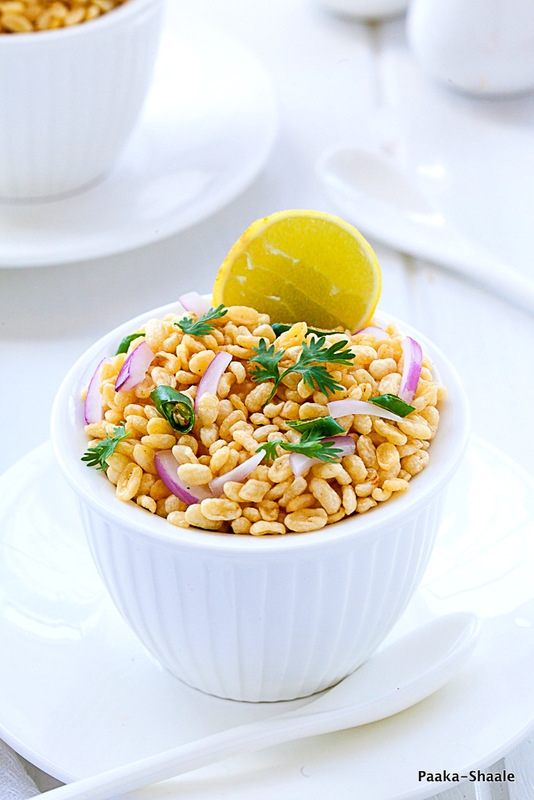 However, the addition of small quantities of fenugreek to condiments and curries only enhances the flavor and aroma of the dish without making it bitter. 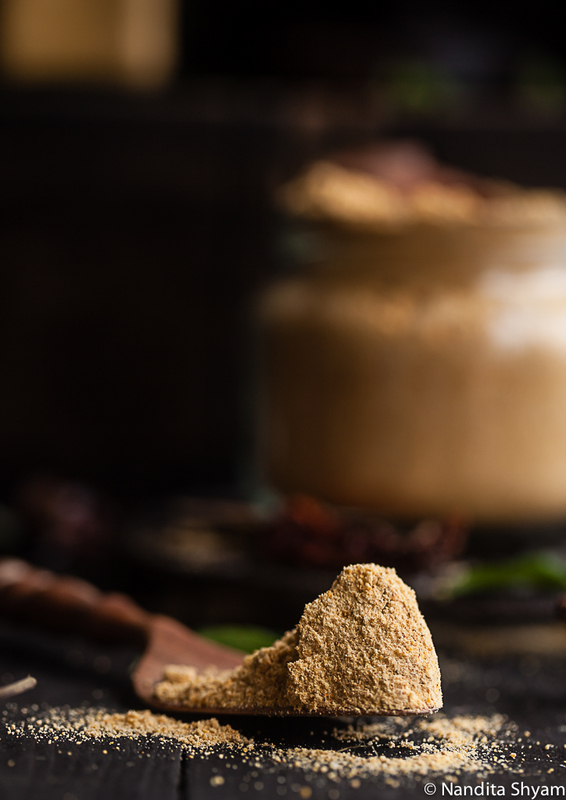 So if you are not a huge fan of Fenugreek seeds, I assure you this condiment is sure to convert you. 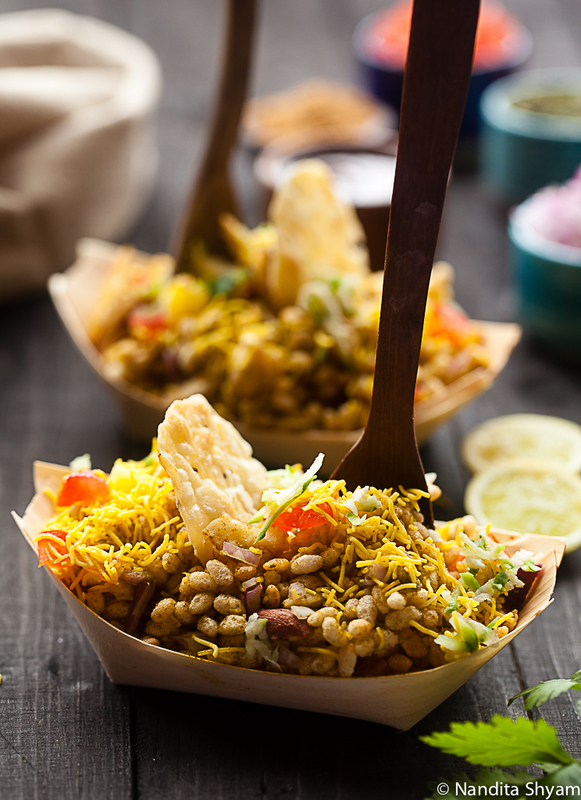 The menthya hittu or the methkoot is basically a healthy amalgamation of Lentils, grains, seeds and spices. This is one condiment that is loaded with proteins and nutrients. Just add a teaspoon of this powder over hot rice, top it with ghee and a dash of lime juice and you will have an instant, delicious rice dish in front of you. As I am writing this post, I am involuntarily transported back to my childhood days. Since I was a fussy eater, I would refuse most of the vegetables. But I would never refuse the menthya hittu. 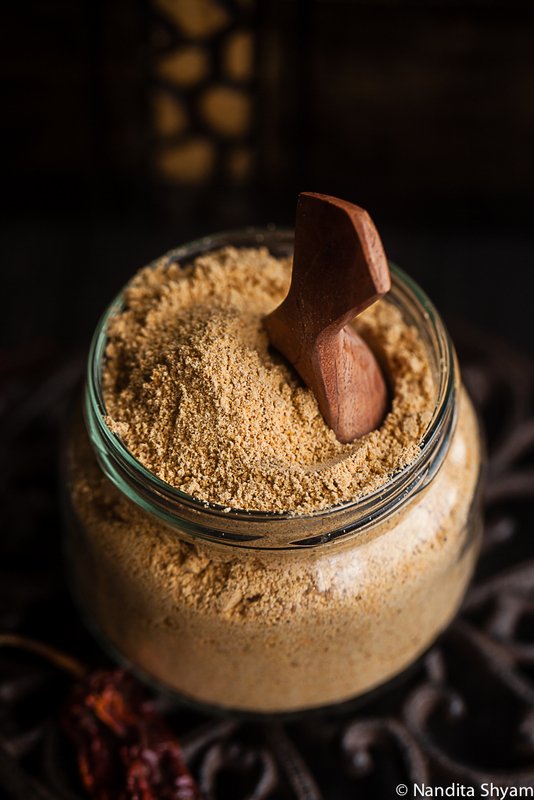 The gojju made out of menthya hittu was, and still is my favorite way of eating this condiment. Just give me some rice or rotis with the menthya hittu gojju on the side and I am good to go. The menthya hittu is a handy thing to have around. Since it is so versatile, it can be used to make at least four different dishes. Each, tasting different than the other. This condiment is very easy to prepare. All it needs is a little care when roasting. The ingredients should be slow roasted on low heat to avoid burning. The list of ingredients might seem a little too long and intimidating. 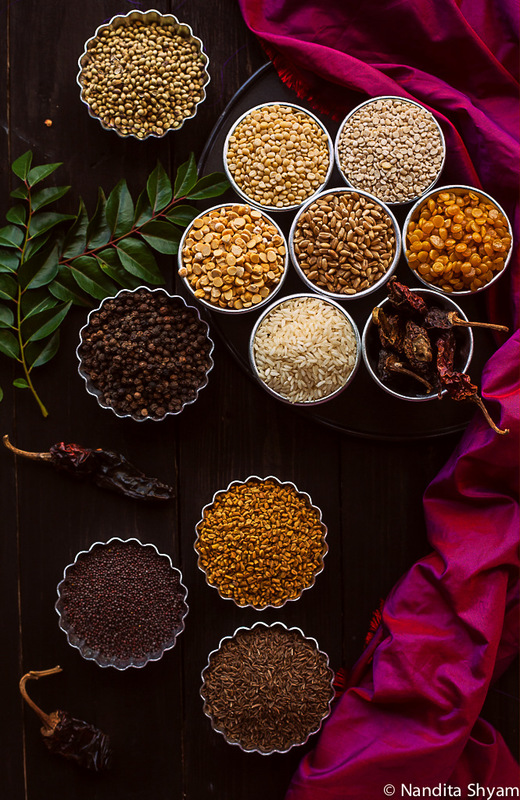 However, these ingredients are pantry staples in every Indian kitchen. Making this spice mix at home has been a happy trip down the lanes of both, memory as well satisfaction. After making this, I realized that nothing can be compared to the punch of a freshly ground home made spice mix. Heat a thick bottomed pan and dry roast each dal separately. Make sure to keep stirring to avoid burning. Transfer the ingredients to another plate or platter to cool. Dry roast the rice and wheat till brown and fragrant and keep aside. Dry roast the seeds one after another and transfer it to the platter containing the other ingredients. Add the oil at this stage and allow it to heat up. Add the red chilies and fry for a few seconds. Add the asafetida and turmeric and fry till the raw smell is gone. Take off the heat and combine it with all the other roasted ingredients and allow it to cool completely. 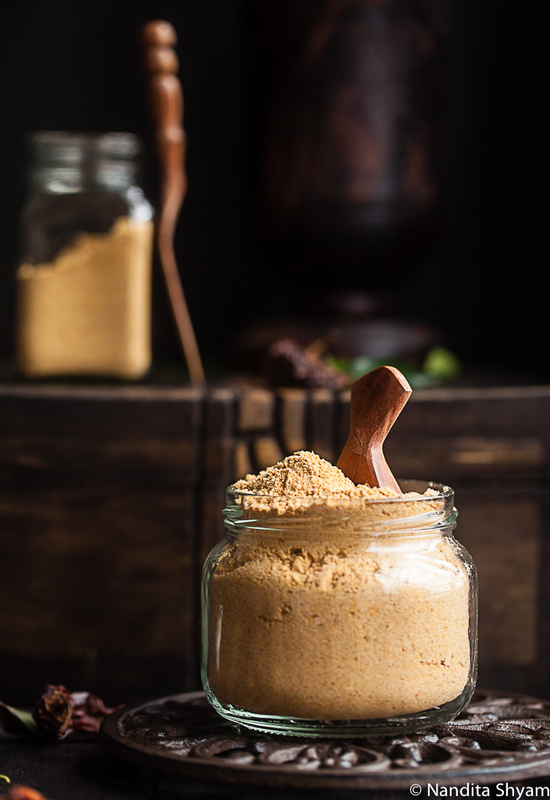 Grind the roasted and cooled mixture in a blender to a fine powder and store in air tight containers. 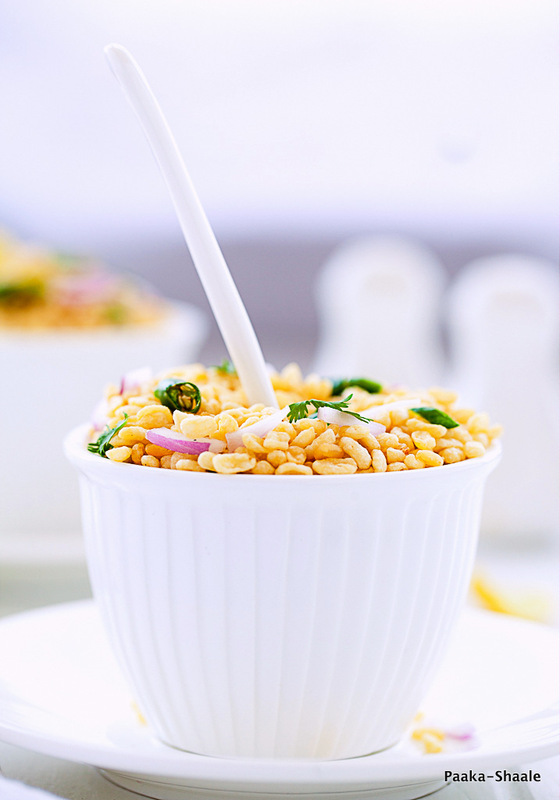 The whole wheat grain can be substituted with equal quantities of Lapsi or semolina. The turmeric is an optional ingredient. You can skip it if you want to. The quantity of the red chilies can be increased if you want this spice mix to be slightly spicy. Sometimes, I wonder if I'm cut out for writing. I say this because, there are times when I can't think of a single thing to write. I do not have any issues with photographing or developing recipes. I always seem to have at least three recipes with photographs in my drafts, waiting to be published. However, I just cannot post them because I really can't come up with a proper write up. I am not sure if it is just me, but I seem to take forever just to put a few sentences together. Do any of you face similar problems? If yes how do you tackle it? I would love some inputs from you. Now let's move on from my rants about Writer's block and come to the food part shall we? 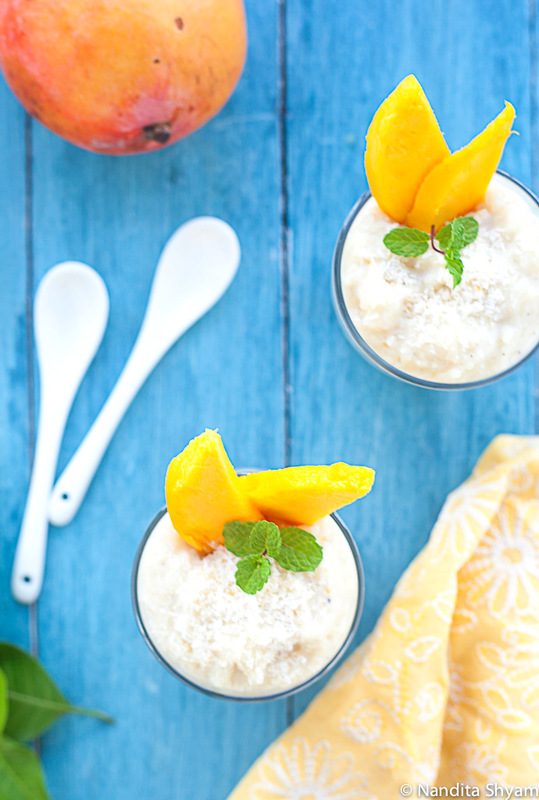 Today, I have a luscious, creamy and tropical dessert for you. This recipe has been there in my drafts for at least a month now. This creamy dessert has all my favorite ingredients. 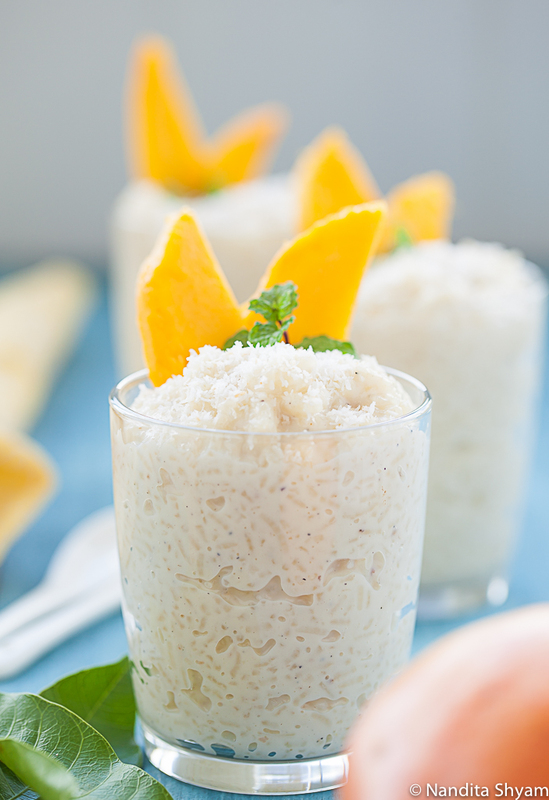 There is the fragrant long grained rice, full fat milk, coconut milk and mangoes. Yes, Mangoes!! I think mangoes are a favorite with most people. I don't think anybody can resist this tropical fruit. Typically, the summers in Kenya lasts from October to February. 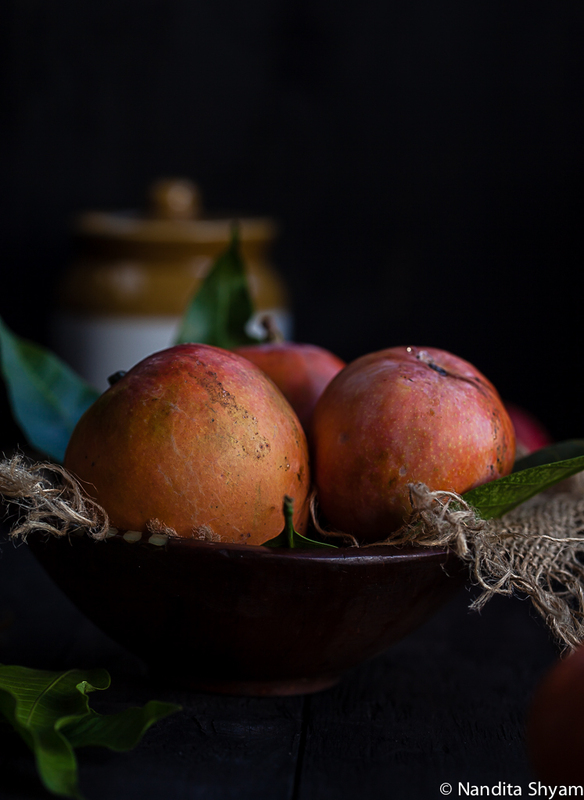 However, thanks to the extended summer, this year, we were lucky to enjoy mangoes even after the fruit season came to a close. Although short-lived, the Kenyan Mango season is rich in it's produce. There are many varieties of mangoes that are produced in Kenya. 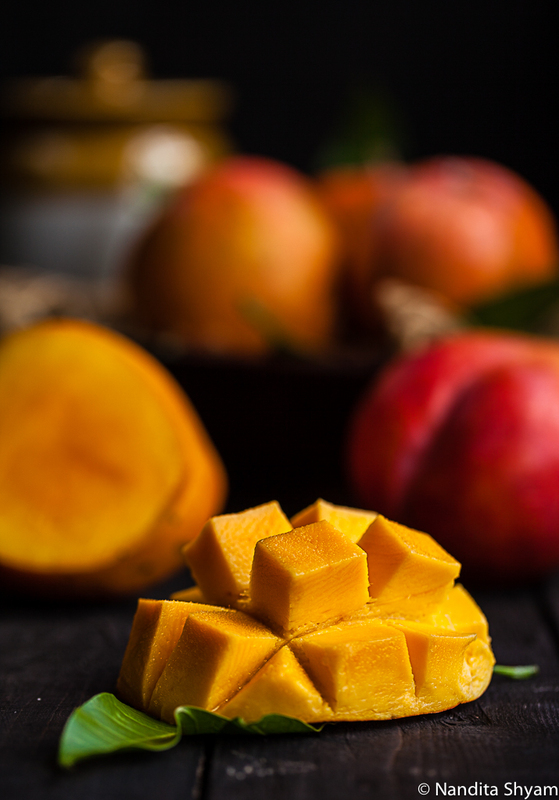 Among all the varieties of mangoes, the Apple mango is our favorite. 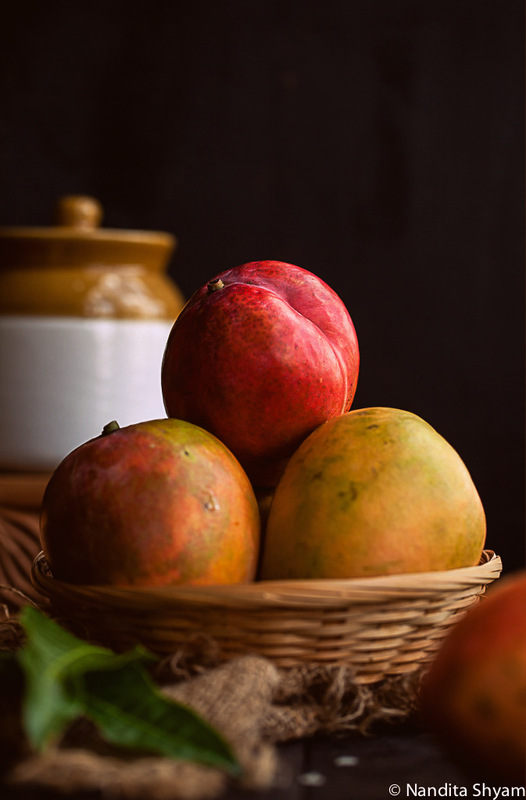 The apple mango is the exotic variety mango that is grown in Kenya. This variety is large and round with a deep yellow-orange to red in color. They come with sweet, fiberless flesh and is known to have long shelf life. Although Puri and Aamras is my favorite way of eating mangoes, I decided to try something new this time. 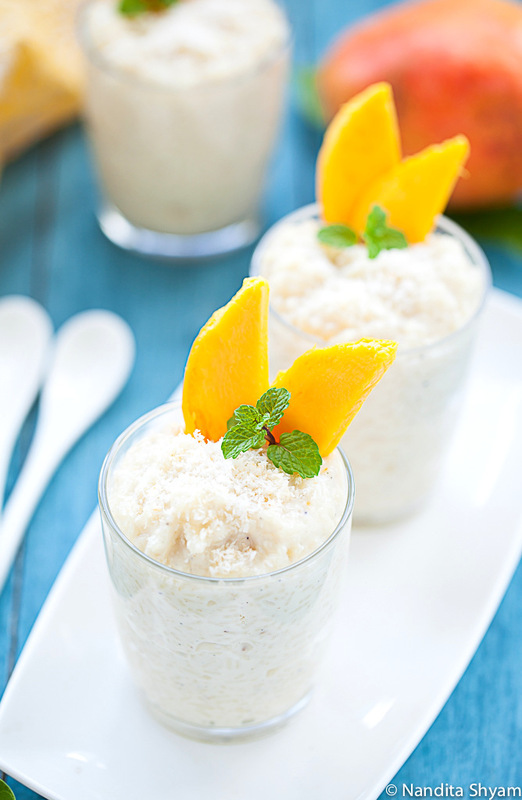 I had heard and read so much about the combination of rice and coconut pudding with Mangoes that I just had to try it. And I must say that it was a hit around the house. 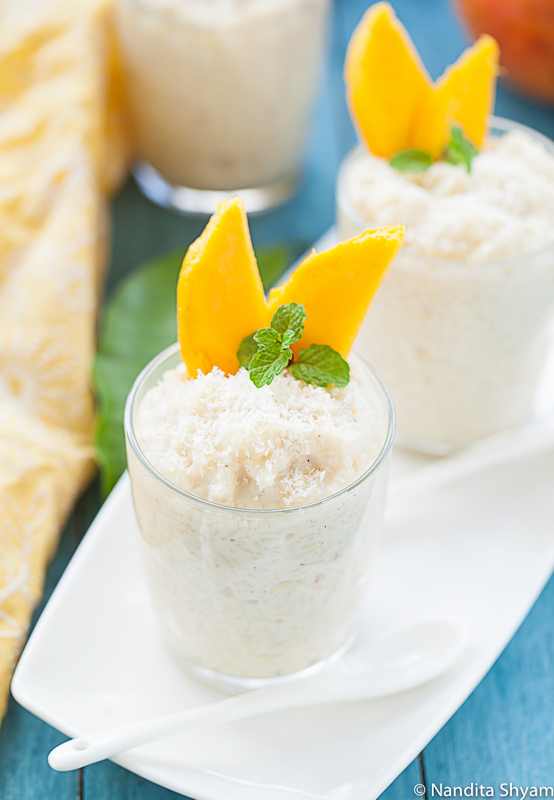 I just adored the flavors of Mango and toasted coconut in this pudding. It was like tasting and embracing all the tropical flavors. Even though this dish is easy to make, it does involve a relatively long cooking time. This is not one of those recipes that can be put together in 20mins. It does take some love and a good lot of patience. I have realized that the secret to a good pudding is to cook it on a low heat until the pudding gets creamier and creamier. Just stir it from time to time and by the end of it, you will be rewarded with a luscious, creamy and comforting dessert!! In a thick bottomed pan, bring the milk and the coconut milk to a gentle boil. Add the rice and cook covered over low heat for 25-30mins, Stirring frequently or until the rice is completely cooked and tender. Add the salt, sugar and the cardamom powder. Mix well and set aside. Serve the pudding warm or refrigerate until completely chilled. Divide the pudding into six equal portions. 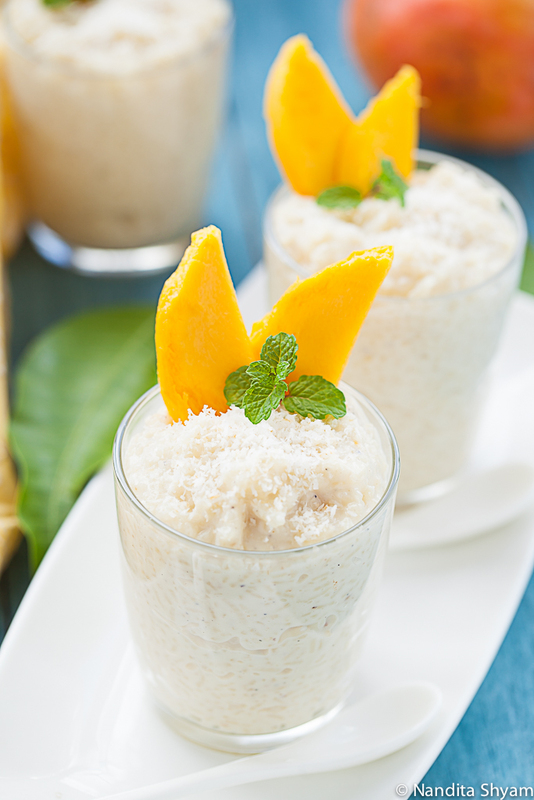 Top it with a tea spoon of toasted coconut and some chopped mangoes. Garnish with some mint leaves and serve immediately. The full fat milk can be replaced with Almond or soy milk for a vegan and dairy free recipe. 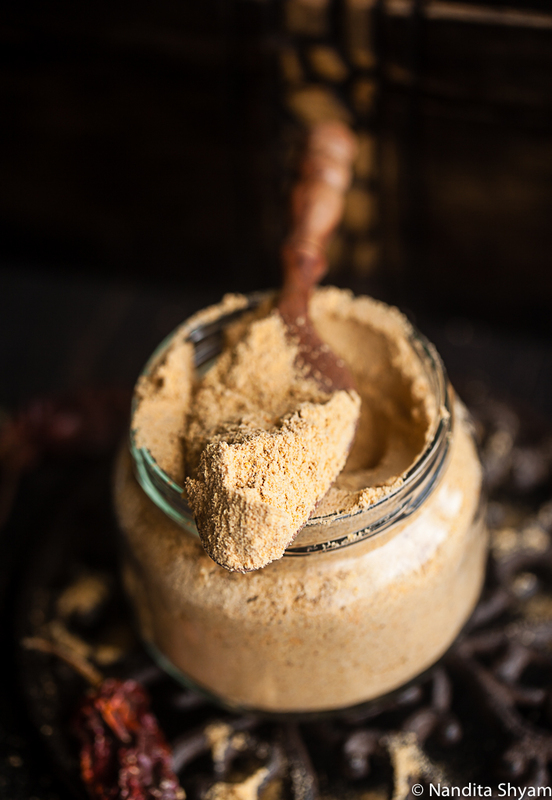 The cardamom powder can be replaced with 1/2 a teaspoon of vanilla extract. Hello there Peeps!! I have been away from my virtual kitchen for a bit and I have missed it sorely. These past few days have been busy. I have to say that I have spent it well doing stuff around the house. I also managed to catch up on some old friends and I also managed to do nothing for a couple of days. It was only yesterday, that I sat down to complete the post that has been lying incomplete in my drafts folder. This salad is one of the easiest and quickest dishes that you will put together. It is one of those two minute recipes that is also healthy and finger licking good. It uses some minimal ingredients and does not include any cooking time. It can be eaten as a light evening snack or as a starter with some drinks. This recipe will fall under those "No Fire" recipes. The crunch from the deep fried moong, spice from the chilies, tang from the lemon and the freshness from the coriander. This salad is full of simple yet bold flavors and textures. A perfect "less is more" salad that is sure to leave you craving for more!! 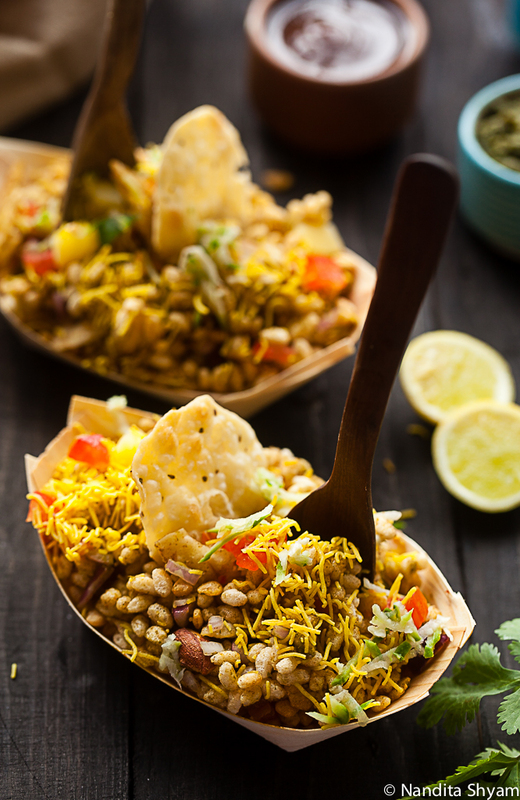 Assemble the fried moong, chopped onion, green chili and salt in a large bowl and mix well. 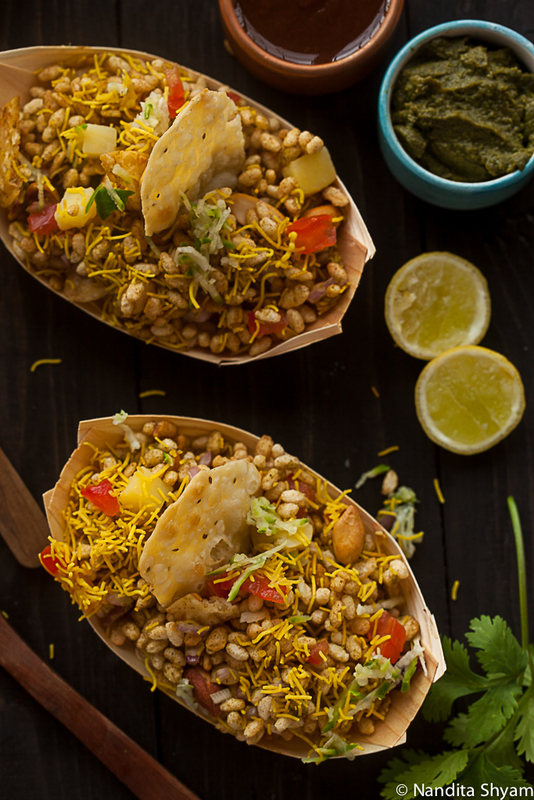 Add the lime juice and coriander leaves, toss and serve immediately. 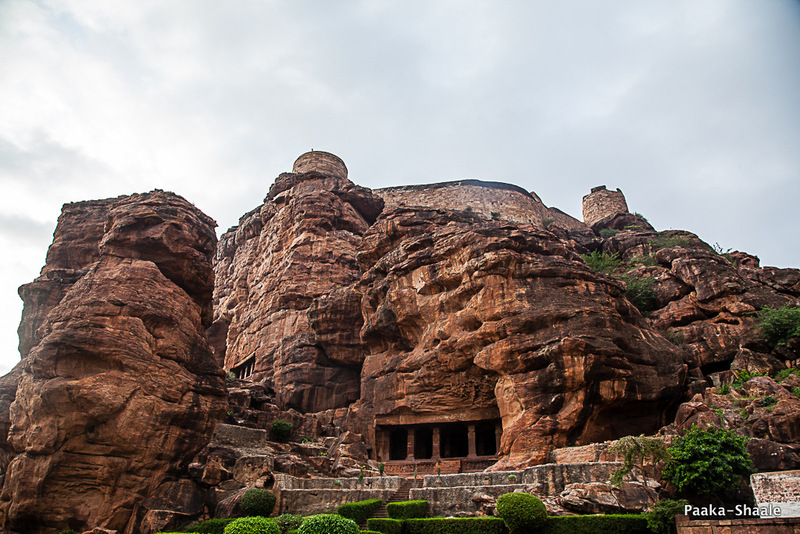 "If you want to understand today, you have to search yesterday"
I am not sure about the exact time since I started getting these pangs to visit the fabled cave temples of Badami. It could be during my childhood years, when I stood staring at the framed painting of the famous eighteen-armed Nataraja that my Grand Uncle had recreated on canvas. Or it could have been during those times when I was studying the rise and fall of the Chalukyan Empire in school. Or did that desire arise when I brought this book called Badami, Aihole and Pattadakal- By George Michell? 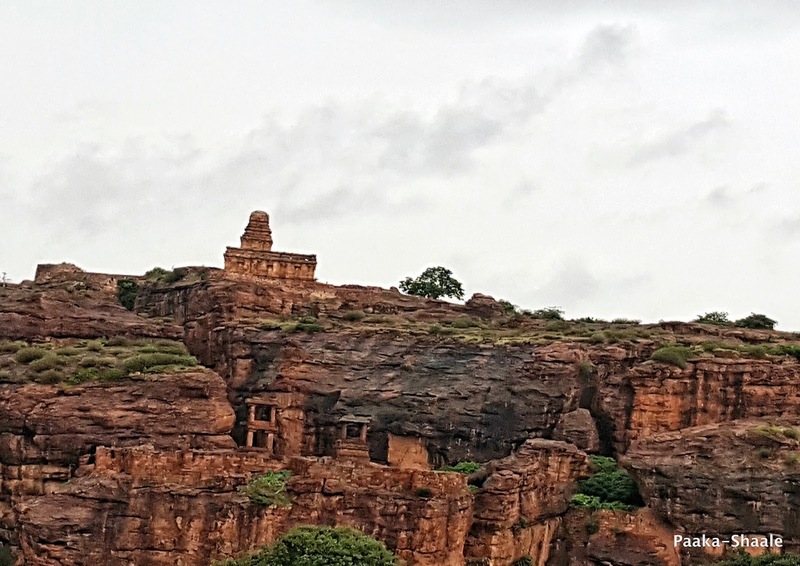 Even though I am not sure about the exact moment, I am sure that my imagination was kindled and created an incipient urge to see the fabled cave temples of Badami. However, my trip to the temple town could only materialize in 2016. My sister and I began to plan for this trip during May, 2016. 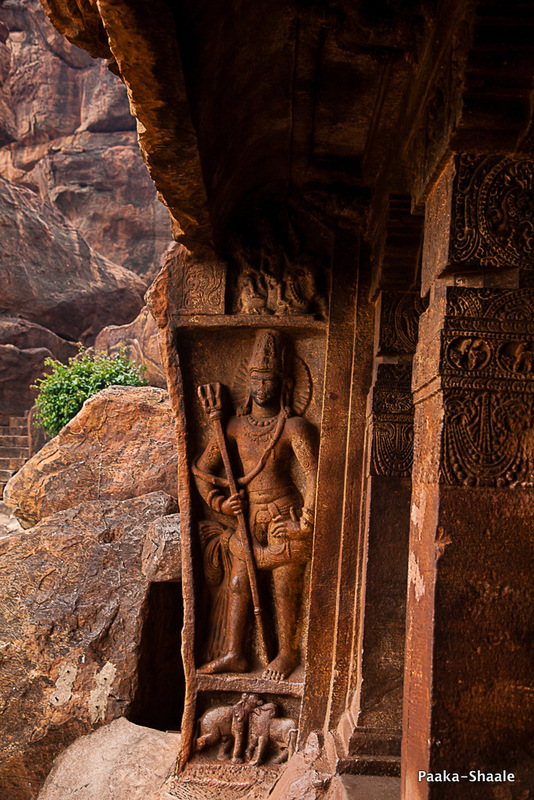 We decided to visit Badami, Aihole and Pattadakal during the month of July. My baby sister made the hotel reservations and the other necessary arrangements. 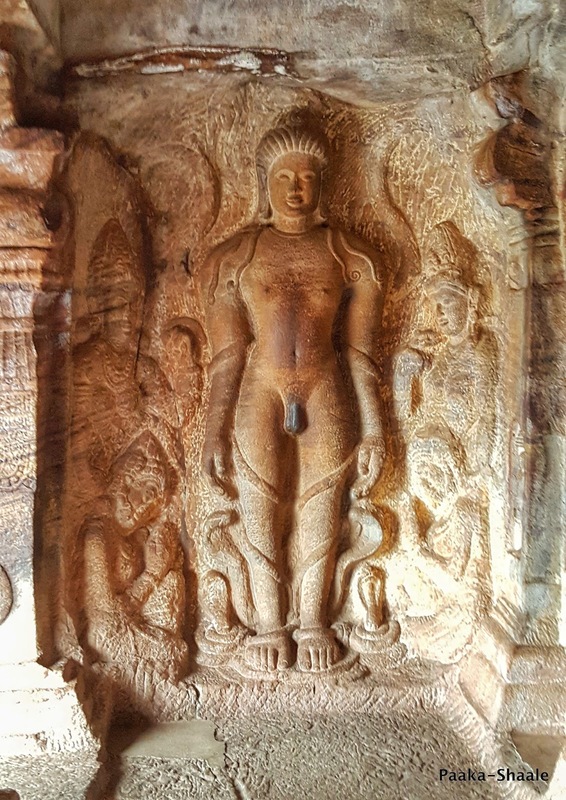 It was an all Girl’s trip and we spent five glorious days exploring Badami, Aihole, Pattadakal, Bijapur and a few other places around this region. Since I have a lot of memories and photographs to share with you, I decided to break this post into a five-part travelogue. I hope you enjoy these posts, As much as I enjoyed writing them. 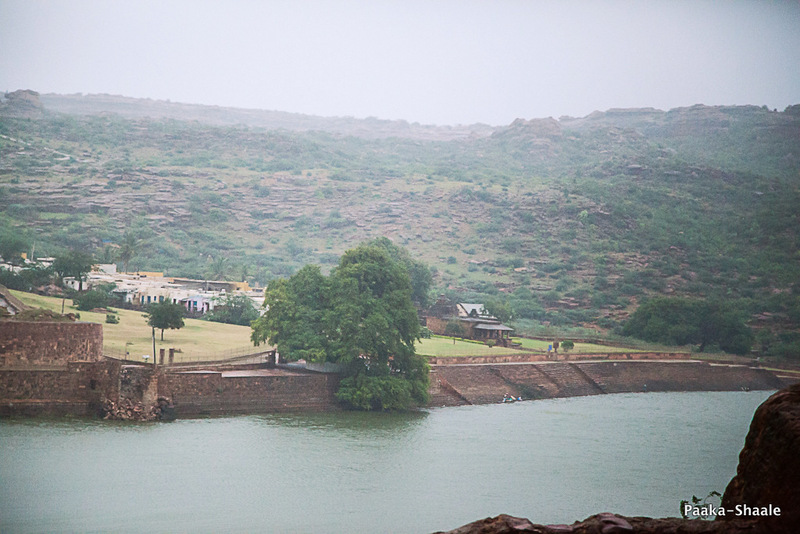 Since we planned the trip during the monsoons, we were a little apprehensive about visiting badami. “What if there is a storm and we get stranded in the middle of nowhere? ?” we thought. However, we couldn’t have visited the place during a better time. The sand stone mountains seemed to come alive during the monsoons. I somehow felt that the rainwater extracted all the hidden beauty of the temple town. The small town magically turns greener and offers breathtakingly beautiful views that can be savored by nature lovers. 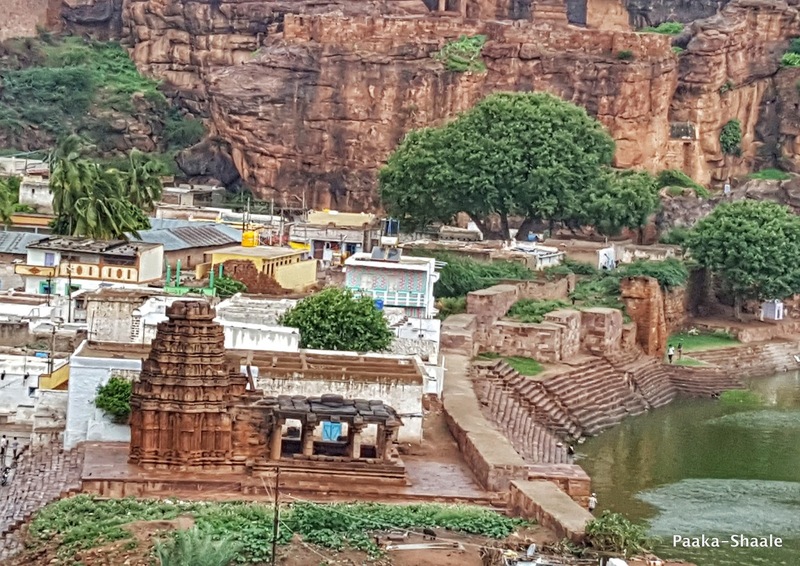 Badami, which is now a small town, was once a thriving capital of the Chalukya dynasty. Who are the Chalukyas? I hear you ask. According to the legends, The Chalukyas belonged to northern Kshatriya Race, who migrated from Rajasthan during the 5th century. 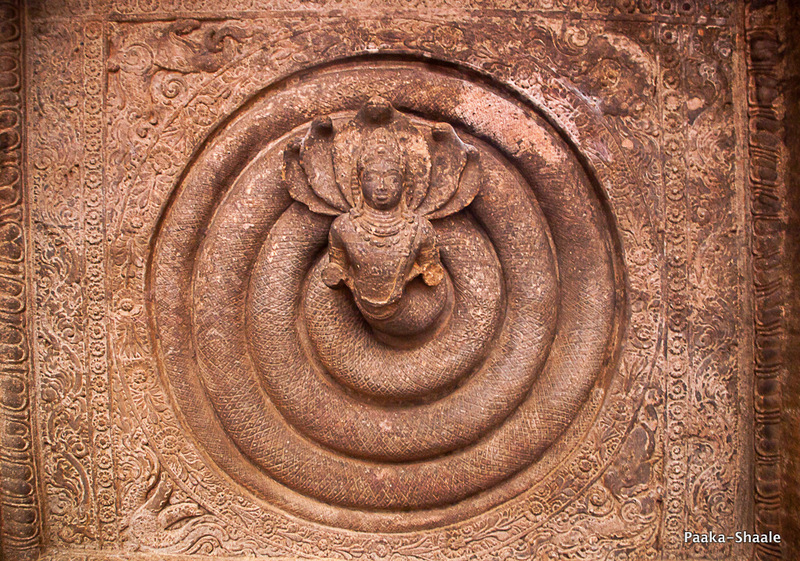 The founder of the Chalukya dynasty is said to be one Jaya Simha. He was followed by his son Rana Raja who was in turn Succeeded by his sun Pulakesin the first. 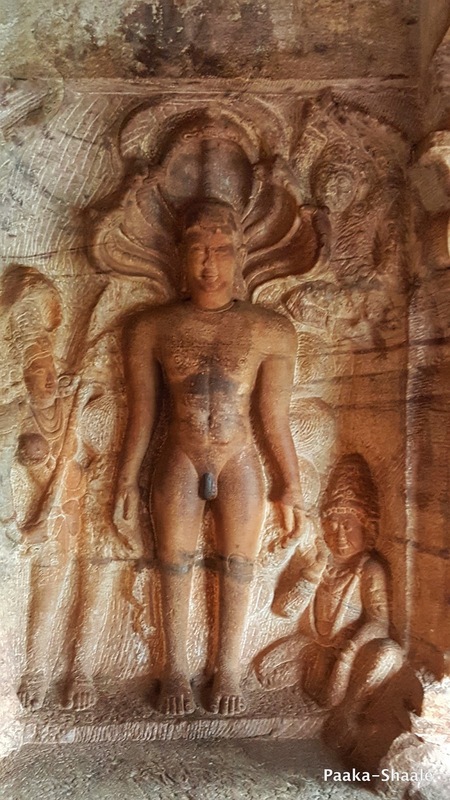 Pulakesin the first ascended the throne and established Vatapi or Badami as his Capital. The credit for the incredible architecture goes to Pulakesin’s sons, Kirtivarman and Mangalesha. 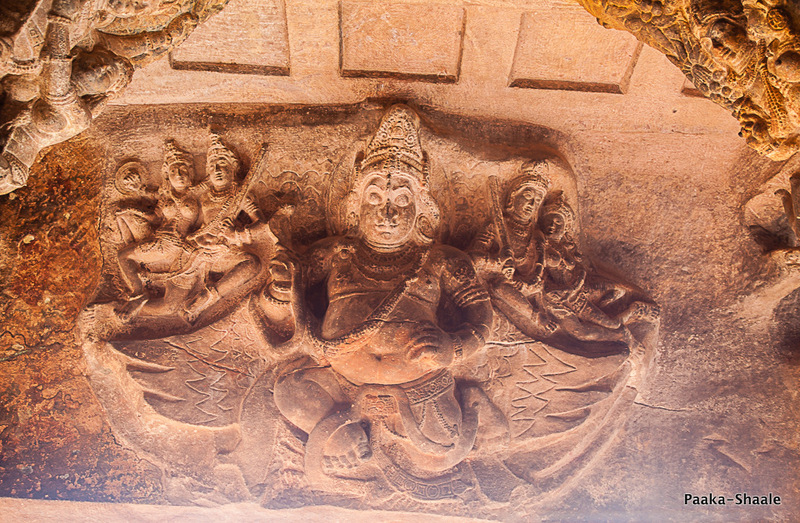 It feels like every nook and corner of Badami tells the tale of the Borthers incredible contribution to art and architecture. 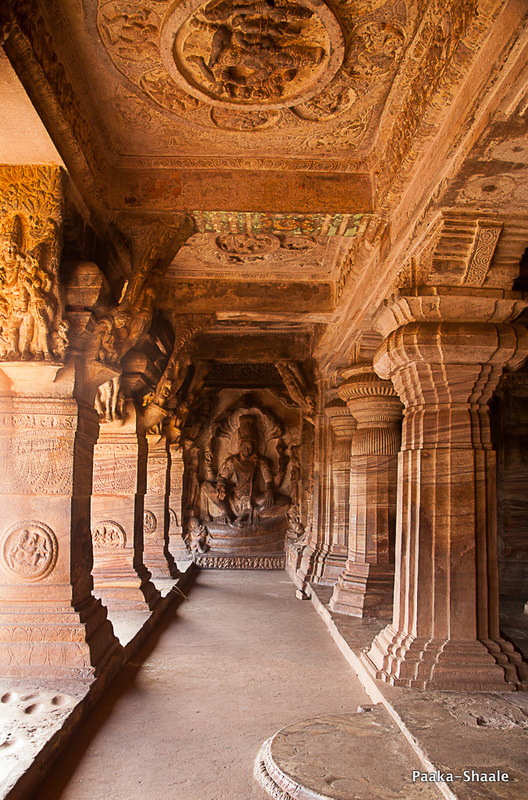 These Cave temples are both mind blowing and captivating at the same time. I couldn’t help but wonder how one could transform something as dismal as sand stone into architectural marvels, way back in 6th century. 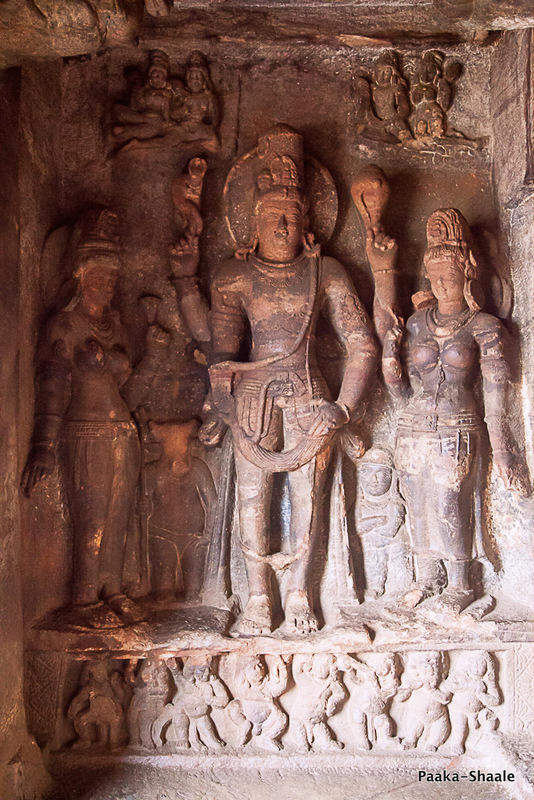 The stones are carved to surgical precision and it seems like each wall in the cave has a story to tell. 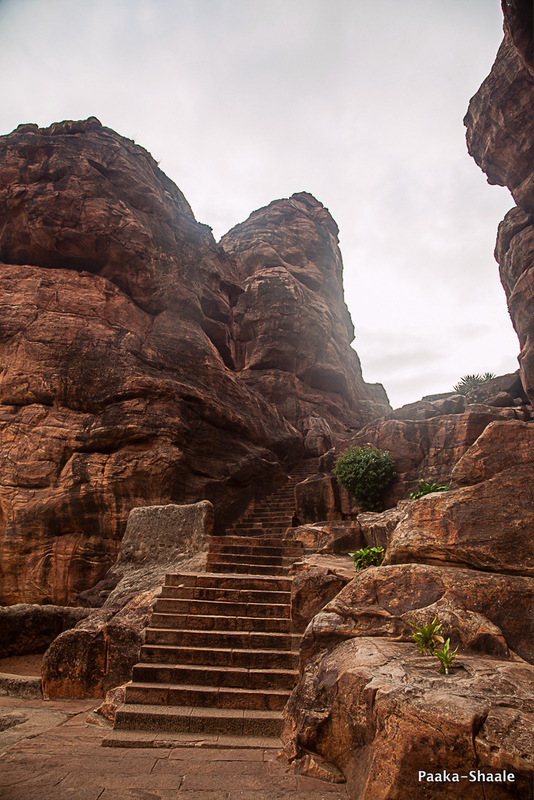 The cave temples of Badami are segregated into four sections. 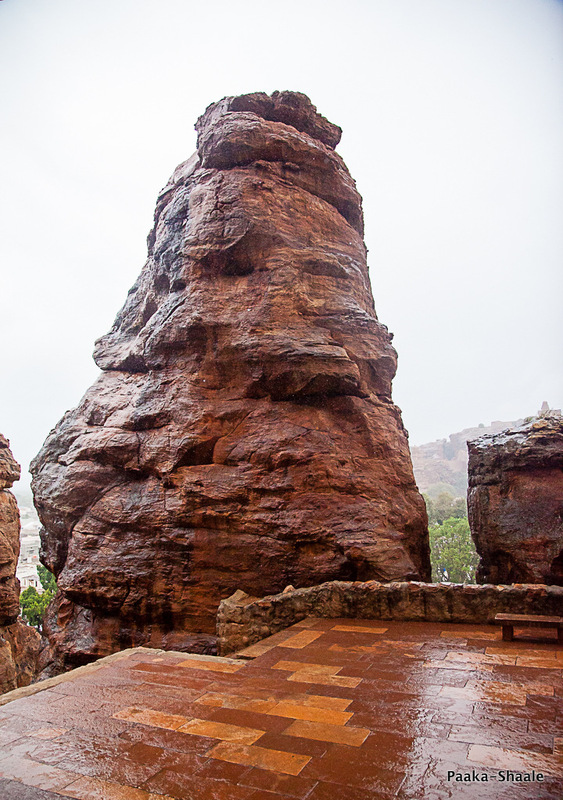 The first three caves are dedicated to Hindu deities and the Fourth and topmost cave is dedicated to the Jain Tirthankaras. This shows that the Chalukyans were tolerant to Shaivism, Vaishnavism, Buddhism and Jainism. The first cave is dedicated to Lord Shiva. 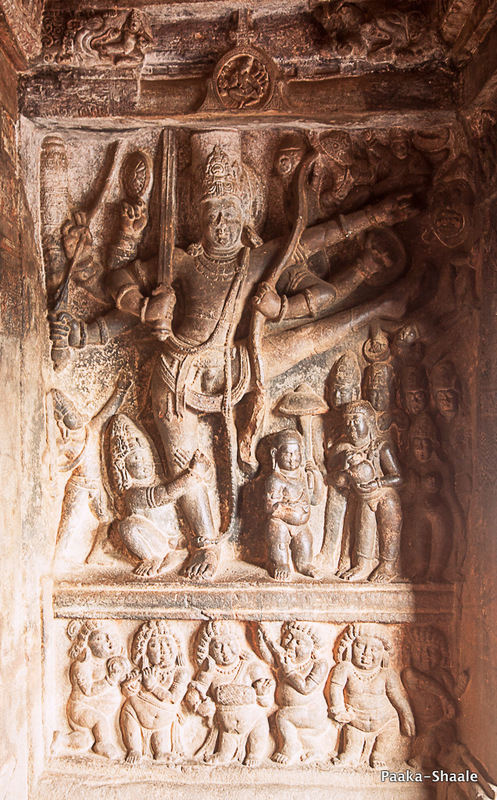 You will find a Dwarapalaka or a Guard on the left side and on the opposite wall you will find the five feet tall, Eighteen armed Shiva, dancing the Tandava, welcoming you. 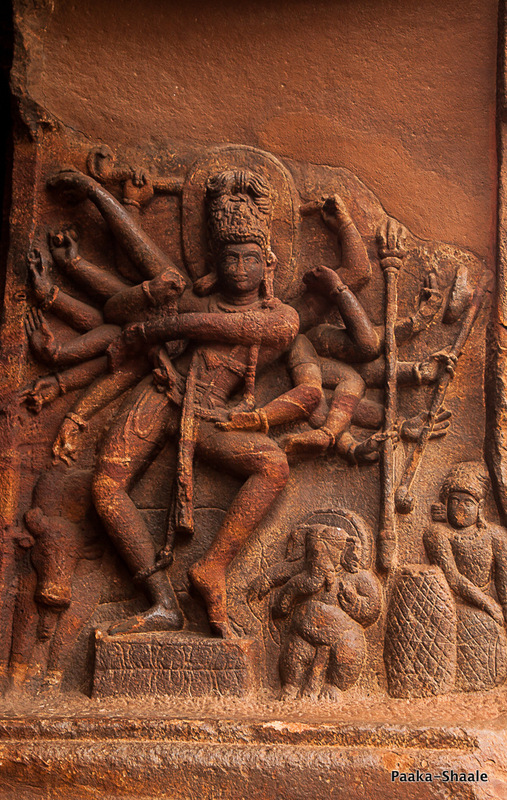 This Nataraja is carved in such a way that each combination of a pair of hands represents a Mudra in Bharatanatyam. 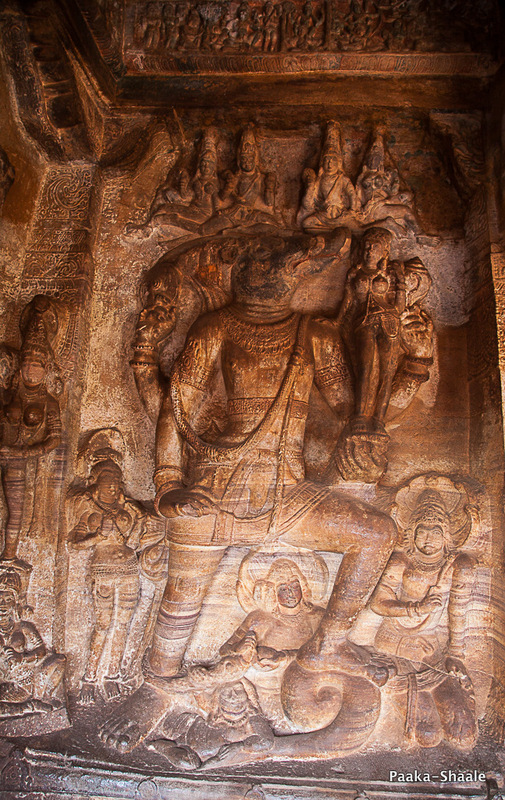 It is said that a total of eighty-one Mudras are depicted in this amazing Sculptre. 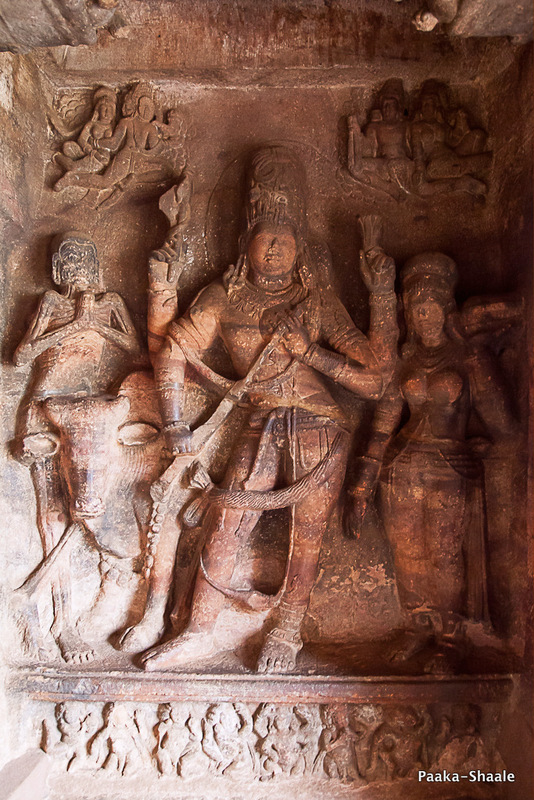 Inside the first cave, you will find Harihara with four hands and Snakes on hair and waist and on the other side there is Ardhanarishwara, attended by the bull and the skeleton Bhiringi. 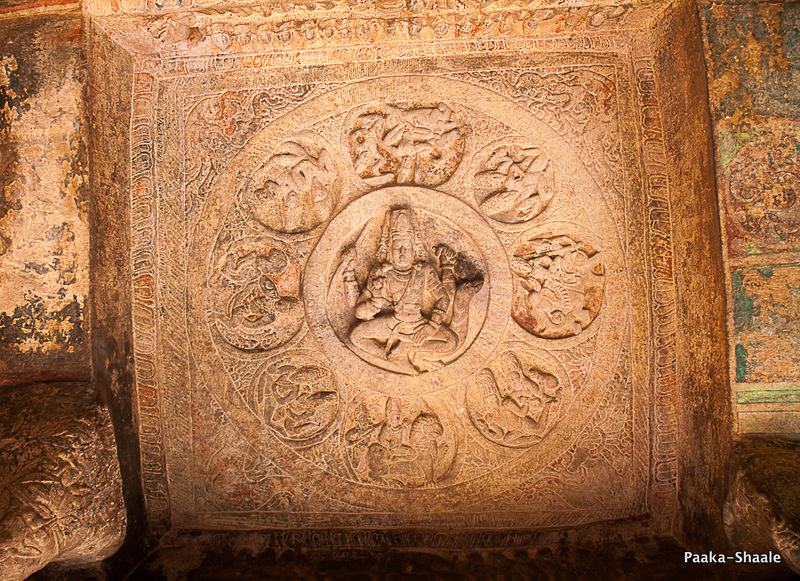 The ceiling of the cave is decorated with a very realistic Adi sesha or the serpant king. The Second cave is dedicated lord Vishnu. 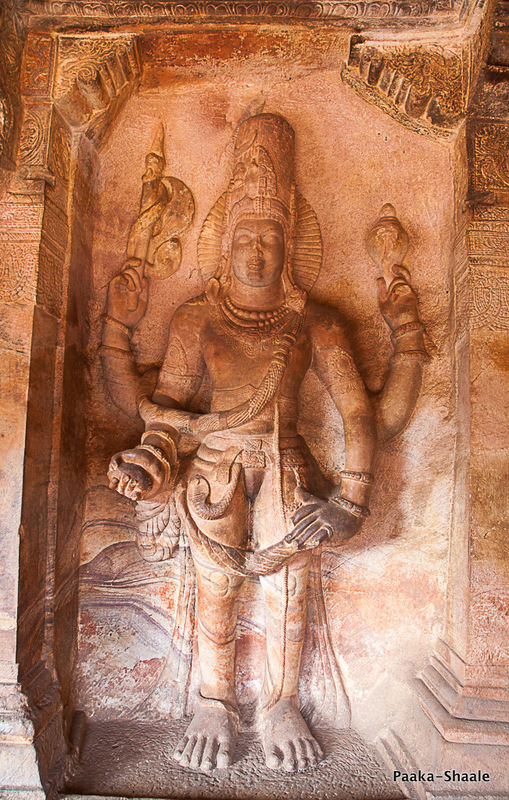 Vishnu is depicted as the Trivikrama or Vaamana with one leg on the earth and the other pointing towards the sky. 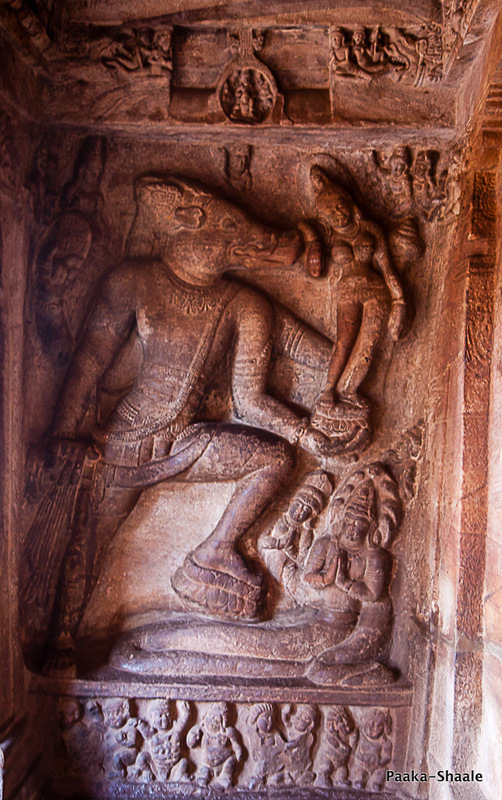 He is also depicted as the Varaha Avatar rescuing mother earth from the clutches of demon, hiranyaksha. 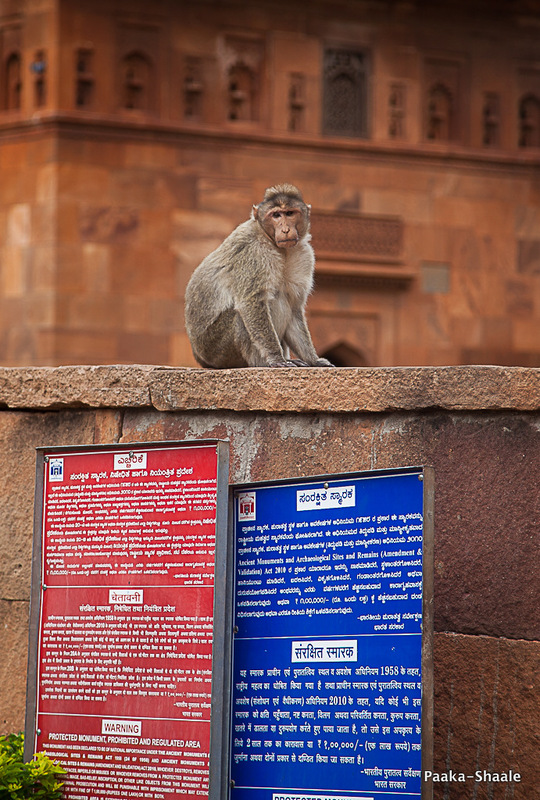 Another Dwarpalaka or guard can be found at the entrance holding a flower. The third cave is perhaps the grandest and the biggest of them all. 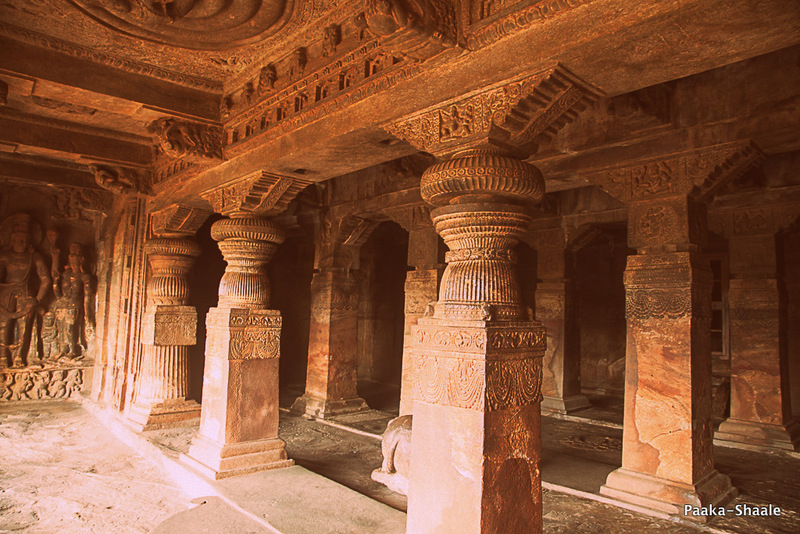 This cave has six pillars and each one is exquisitely carved with festoon like chains. 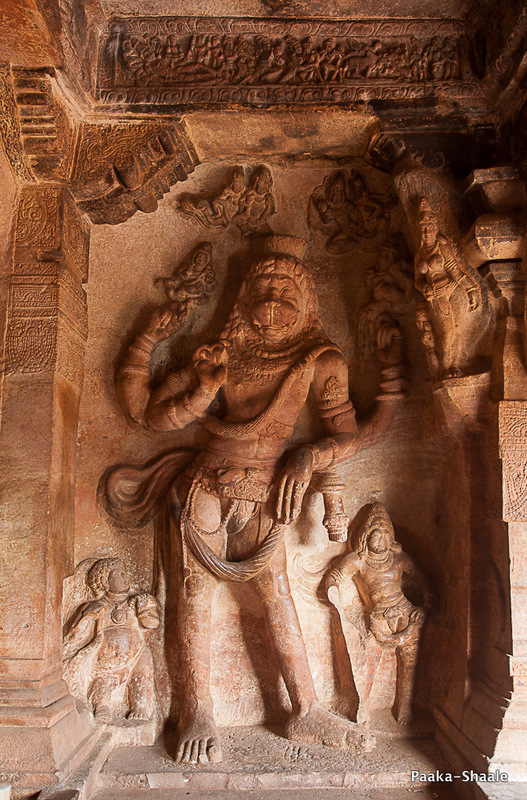 There is a glorious eleven feet high Statue of Narasimha on the west wall and a statue of Harihara on the southern wall. 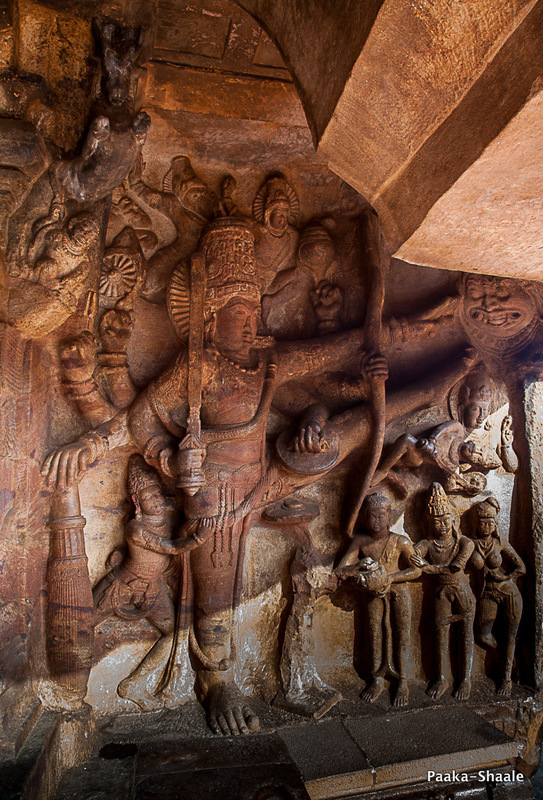 There are also depictions of Trivikrama (vamana) and Varaha avatars in this cave. 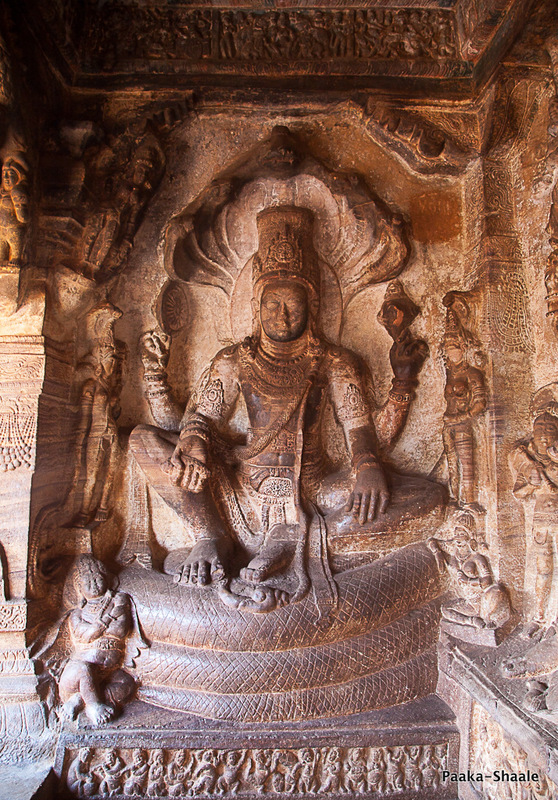 But the most beautiful sculpture in this cave temple has to be of the one where Vishnu is seated on the coiled Adi Sesha. It is a rare pose and one doesn’t get to see this often. These sculptures left me humbled, dwarfed and in a state of awe!! 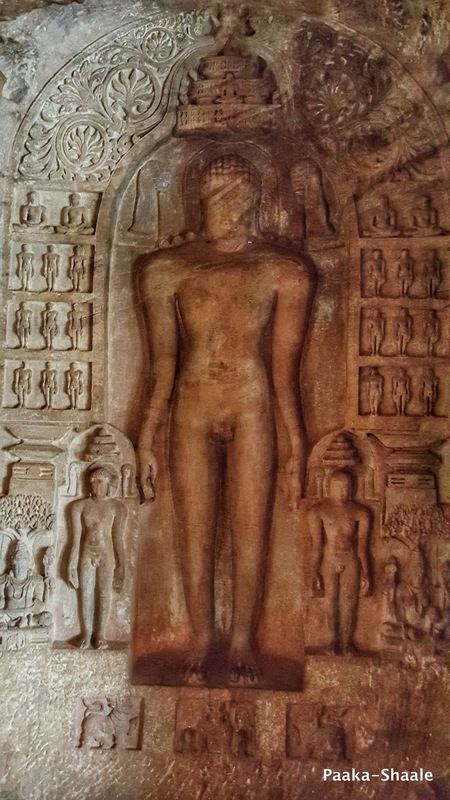 The fourth cave is a jain temple and is dedicated to Jain tirthankaras. Unfortunately I could not photograph in this cave because of the fading light and the lingering monkey menace. All I could manage was a couple photographs on my cell phone. One word of Caution!!! These caves are full of monkeys. They have the reputation of snatching handbags, food, water, etc. One monkey almost snatched my mother’s handbag. It would have disappeared with it too had my mother not put up a brave fight. As we left the pinkish-brown sandstone mountains of Badami, turning golden in the setting rays of the sun, I felt humbled and content. It truly melted my heart and made me wish that I return to this amazing place again. 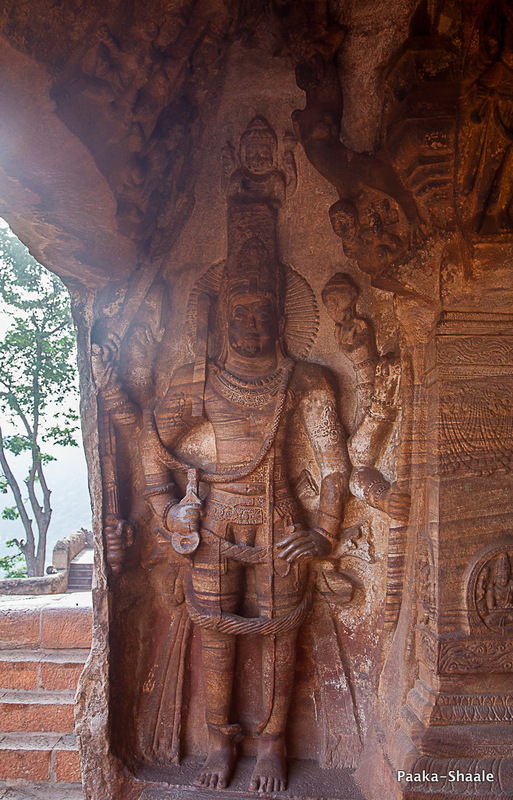 I hope that my travelogue entices you to pay a visit to this magnificent place called Badami.